The Holy Prophet Daniel lived about 500 years before Christ and was a prince for a time in King Nebuchadnezzar’s court because of his correct interpretations of the king’s dreams while in captivity in Babylon with the Israelites. He was later thrown into a lion’s den, yet miraculously was saved and even fed by the Prophet Habbakuk who was carried there by an angel. The Prophet Daniel remained faithful to God and suffered because of this when King Nebuchadnezzar had set up an idol of himself and on a certain day demanded that all in his kingdom bow down and worship this golden idol in the Plain of Dura. It was from this disobedience to worldly authority which resisted God’s commandments that the Prophet Daniel was put in the lion’s den. 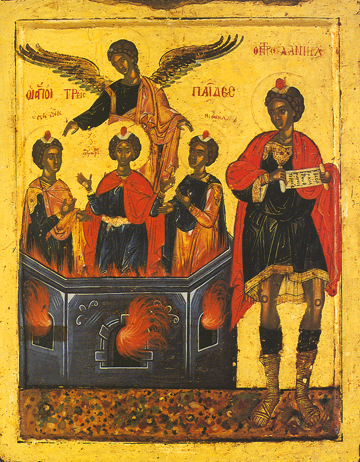 Three Holy Children, Ananias, Azarias, and Misael, also refused to be idolaters and so were thrown into a furnace heated seven times more fiercely than normal. An angel of the Lord, representing Christ, was seen with them in the midst of the flames, which did not burn them or even cause them discomfort, much to the amazement of those who looked on, including King Nebuchadnezzar.